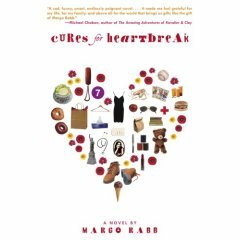 In this collection of loosely-interrelated autobiographical stories, Rabb tells the story of 15 year-old Mia losing her mother suddenly to cancer, and having to stumble through with only her father and testy older sister. Through these short stories (several of which were published previously as stand-alone pieces in earlier drafts) she outlines the various feelings and experiences she goes through. While the characters are nicely drawn out and there is some poignant writing going on here, I found the novel rather dull. While marketed as "teen," this is really an adult book about being a teen and a YA story. And I find it hard to imagine that teens will find much in it either, except to share an adult's perceptions of growing up without a mother.